Phil previously posted about his 3,000 mile road trip. Those who know Phil personally will not be surprised to hear that he did it in record time. However, after an estimated 40 hours with almost no sleep and nothing but McBurgers to eat, Phil did take the time to have a real meal. 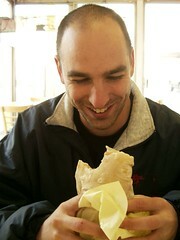 Boy, was that kid happy to see a burrito. Carne asada, con todo - his only complaints were the lack of black beans and the parking ticket he received for having a truck with a sign on it. This Benitos Taco Shop meal was rated: 6.6. Wednesday, February 22, 2006 by Jonah.